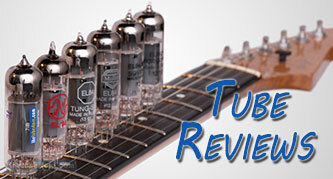 Tube shields and retainers get zero love in most guitar and audio journals. At some point in time a person thought that they were important and they’ve been used ever since. Why do we have them? And why do we use them? It would seem that the purpose of these devices is strictly functional, although, I think a set of hand engraved and polished tube shields would look great on any system. Steam Punk retainers perhaps? For the moment, let’s just focus on the functional aspects. In small 9 pin tubes, you usually see a combination of tube socket and shield or retainer. Probably the most common in guitar amps is the spring loaded metal shield that twist-locks to the base. 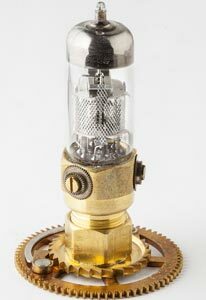 This acts as a retainer to keep the tube seated and a protective shield for the glass bulb. It’s supposed to provide both mechanical protection and radio frequency (RF) shielding. I can guarantee that they will provide mechanical protection and hold the tubes in place. The problem is that some tubes made today come very close to jamming in the raised base attached to the socket. It can be really difficult to get the tubes out and the force required to insert them is almost more than you want to apply. As for RF shielding, you may be able to really shield a tube from RF if you used a modified shield built like a faraday cage. However, shielding the tube may not be enough to kill hum or RF if you have nothing more than a single wire between the amp inputs and the grid of the first pre-amp. The other 9 pin retainer used in many amps is a simple wire clip. There are 2 loops on the socket base, and a spring steel clip attaches there. When the tube is installed the wire clip is raised and slips over the top of the tube, holding it in place. No protection of any kind, other than preventing the tubes from falling out. 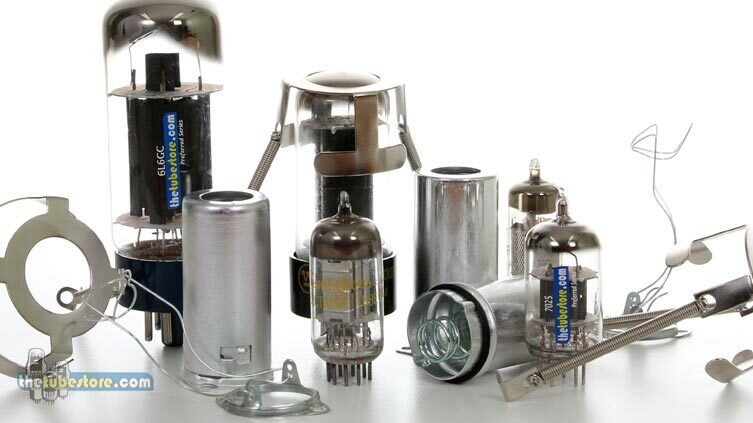 Power tubes are more likely to have their shielding embedded into the glass bottle, if at all. Retainers for power tubes usually come in 3 flavours. EL84 tubes generally use a longer version of the wire clip design used for 9 pin tubes. The American standard retainer is the “bear trap”. It got that name because it looks like a bear trap ready to snap shut. 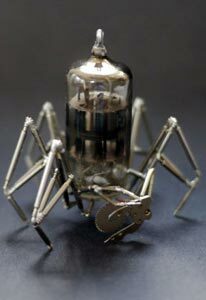 They are made from spring steel and made a bit smaller than an octal base. Because they are slightly smaller, they spread apart as you insert the tube, while small teeth on the clip dig into the base. They are very effective at holding tubes in place, but they will badly mark your tube bases and may make them unreturnable if you don’t like the sound. Bear trap style retainers. We advise against these as they damage the base of the tube and are less secure. The third common type of retainer is a combination of a basket sitting on top of the bottle, connected to the socket or chassis using 2 springs. The first time I saw these was on amps coming from the U.K. Old Marshall amps used woven hemp fibre baskets, connected to the chassis by a spring on each side. Before using them you dampened them in water and attached them to the tube. The damp fibre would stretch and then dry, creating a perfect fit for the tube. Vintage Mesh Retainers often made from glass fiber, hemp or asbestos. Today you get a similar type of spring retainer except it has a tin basket that sits on top of the bottle. thetubestore.com sells a variety of spring retainers sized to more closely fit different tube types. In situations where vibrations are a concern, such as combo amps, high temperature rubber rings for these retainers are also available to dramatically reduce vibrations between the metal retainer and tube. If you guitar amp seldom leaves home, then retainers and shields probably aren’t that important to you either. When the tube sockets are in good condition there’s no way the tubes should fall out. If your tubes can fall out or come out with a gentle pull, then you should have the sockets fixed or replaced. But if you travel with your gear then they can become really important. There’s something about vibration in trains, planes and automobiles that can cause equipment to fall apart. When on the road or being roughly handled tubes can fall out, or more accurately, can be knocked out, bounced out or dropped out. We have focused on guitar amplifiers here since retainers are rarely required in home audio. If you’ve invested in a nice home audio system, retainers and shields are likely the last thing you want to see. Unless you want to invest in those hand engraved models. Being that the tubes sit upright in these systems, there is no risk of the tubes falling out. 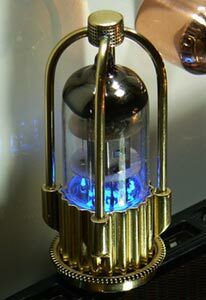 However, some tube audio systems benefit from the use of tube damper rings or vacuum tube radiators. So that’s my take on tube retainers and shields. If you need them, then use them. If you like to swap tubes or are doing listening tests, then things are much easier without them. HI DHIRAJ I NEED 2 SHIELDS FOR MY12AX7……CAN I ORDER….????? Is there a secret to keeping those heat-resistant Teflon power tube rings to stay in place while you try to get the spring retainers on? It can be pretty interesting adventure sometimes, and pretty startling when they just suddenly slip off with a loud snapping noise LOL.